We were introduced to stray Nathan by an elderly lady who had been feeding him. He was not in a good way: he was full of fleas and worms, had extensive dental problems and had not been neutered. He was taken into Cats Protection’s care and we ensured he received the parasite and dental treatment he needed. After the recommended waiting time, during which we tried in vain – and failed – to find an owner, he was neutered and blood-tested which revealed that he was FIV positive. Feline Immunodeficiency Virus (FIV) is the feline equivalent of HIV though there are distinct differences between the two infections. FIV is transmitted from cat to cat through infected saliva passed on primarily through bite wounds. 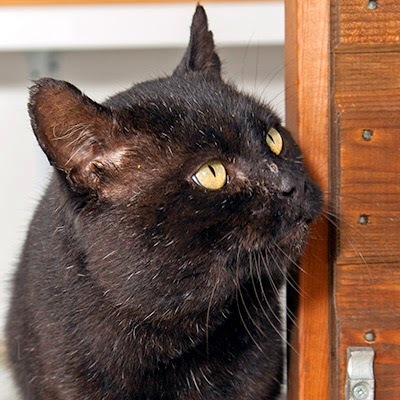 In the care of our fosterer Nathan responded well to good food and a comfortable warm bed, but we were all very concerned for his future as FIV positive cats cannot be allowed to roam and can only live in an indoor situation. With the help of some gentle care and a few cat treats, he was becoming quite a "cuddle-cat" and we were all determined to do our best for him, feeling that he had already been let-down by the human race. We asked the National Cat Centre in Sussex for help and they recommended the Cats Protection adoption centre in north London that successfully rehomes many FIV positive cats, because of its location with many potential adopters living in apartments wanting indoor-only cats and felt confident that they could find him a loving forever home. Within just a few days of being at the North London Adoption Centre, he was chosen by new owners and has gone to live in a luxury three-bedroomed apartment. We hear that he has settled well and has already trained his new owners to pander to his every wish! Veterinary note: FIV is a virus in cats that is similar to the human virus, HIV or Human Immunodeficiency Virus. However, FIV does not infect humans, and HIV does not infect cats. Cats primarily pick up the virus through fighting – via bite wounds – or through mating behaviour, but it can also be passed from an infected female cat to her kittens. Cats Protection recommends that FIV-positive cats are kept indoors and only allowed outside in an impenetrable garden or safe run. They should not be allowed direct contact with FIV-negative cats. I have a rescue cat who is FIV positive. He had a similar background to Nathan and got overlooked for 8 months while waiting for his forever home - luckily for me! He is lovely and a very welcome and loved member of the family.